One of the great improvements of the recently released WordPress 3.3 is the enhancement to the contextual help feature for admin screens. Originally, the contextual help screen was largely rudimentary, and designed to display basic text. However, contextual help was improved considerably in WordPress 3.3, with an all-new Screen API, and UI enhancements such as tabs and a sidebar. These enhancements are perfect for organizing contextual help, especially for Themes with complex Theme options, and/or tabbed UIs for Theme settings pages – in other words, these enhancements are perfect for UpThemes! So, I’ve been experimenting with incorporating the new hotness in our Themes. Especially compared to the previous iteration, the WP 3.3 contextual help is actually quite simple to integrate. Otto Wood wrote a detailed tutorial here. The 'content' parameter expects a string, but this parameter can be replaced with 'function' in order to pass a callback instead. Since our Themes already ship with a “readme.html” file, we can simply pass it here as a string, via file_get_contents(). Here, you can see the contextual help panel, with several tabs. 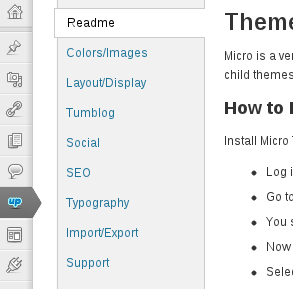 The "Theme Documentation" tab includes the (HTML) content of the Theme's existing readme.html file. 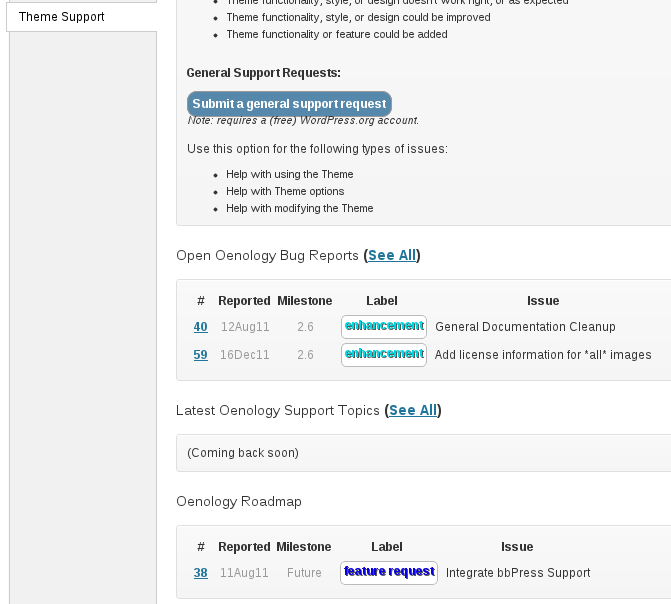 And here you can see the several tabs in the contextual help panel - one tab for each of the UpThemes settings pages. Notice, in the tab list, a “Support” tab at the bottom. This tab is something else that I’m working on integrating into our Themes. Here's how the contextual help support tab looks in Oenology. The data are all pulled in dynamically, from the wordpress.org support forum, and via the GitHub API. This will be essentially the same, once I implement the oAuth tokens to be able to read GitHub API data for private repositories. Look for these features to be rolled out into our Themes in the very near future! For current and future UpThemes customers: how would you like to see these features implemented? What would you find the most useful?